The Osborne, the rust-colored Romanesque/Renaissance Revival fortress that watches over Manhattan&apos;s Carnegie Hall like a hawk, has a star-studded, storied history. Since its opening in 1883, the luxury apartment building, whose glittering Byzantine-style lobby showcases sculptures by Augustus St. Gaudens, murals by John LaFarge and work by Tiffany Studios and French designer Jacob Adolphus Holzer, has been the residence of choice for musicians, writers and artists. The building that counted conductor Leonard Bernstein and pianist Van Cliburn among its tenants also was home to Lorenzo Alvary, a bass who voiced character roles at the Metropolitan Opera for some three decades before retiring in 1978. During his career at the Met, Alvary played 53 roles that he performed 983 times. He made a voice for himself by singing the part of Antonio in Mozart&apos;s "Nozze di Figaro" and Alcindoro in Puccini&apos;s "Boheme." Alvary and his wife, Hallie, occupied one of the Osborne&apos;s 10th-floor penthouses, and as time went on, they bought two adjoining units, ultimately assembling a 3,000-sq.ft. space that served as home as well as office and rehearsal space for the opera singer. When the Alvarys passed away, the penthouse co-op was passed down to a granddaughter. 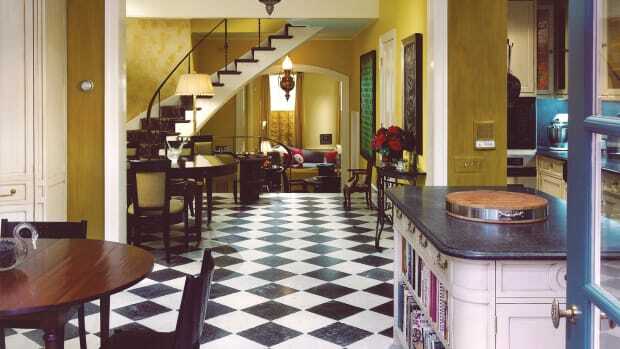 It was she who commissioned the award-winning firm of Zivkovic Connolly Architects in New York City to refresh and restore it in keeping with the more contemporary lifestyle of her and her family. "She was very close to her grandparents, and she has a very strong emotional attachment to the penthouse," says Brian Connolly, AIA and a member of the Royal Institute of Architects in Ireland. "She wanted to keep as much intact as possible because she had so many good memories of her time spent there with her grandparents. She and her husband, an international banker, split their time between New York and Geneva, and they also wanted to live in the Osborne with their sons when they are in New York." The restoration of the penthouse in the National Register building relied not only upon the granddaughter&apos;s memories but also on on-site studies of other apartments in the building. "It is typical in an architecturally historical building such as this for us to visit a couple of its apartments," says Connolly. 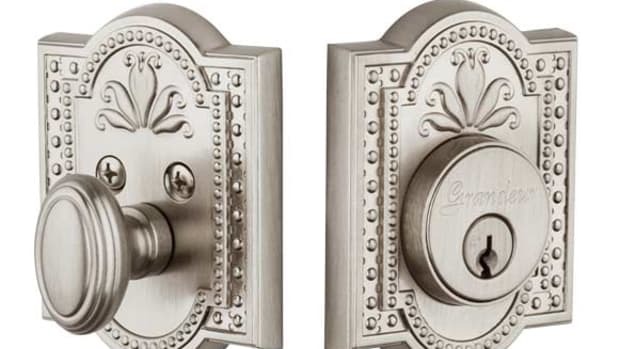 "But residents of the Osborne seemed especially proud of their homes and were surprisingly eager to open their doors to us and share notes on original detailing. So, in this case we were able to see almost a dozen units, and we were able to research and replicate missing architectural elements, confident that we were being faithful to the building&apos;s quirky architectural history." 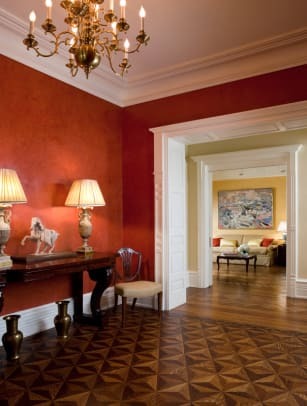 One major project was the restoration of the penthouse&apos;s once-rich parquet floors, which had suffered from much wear and water damage before the Alvarys bought the apartment. The decision to cover the wood with wall-to-wall carpeting was driven as much by convenience as it was by the fashion at that time. "We really wanted to bring the parquet back because the complex geometric designs are a hallmark of the Osborne apartments and one of its most treasured features," says Connolly. "We had the flooring contractor disassemble them piece by piece and carefully restore them. In some cases, the parquet and the borders had to be reconfigured to suit adjusted room layouts, but about 90 percent of the wood is the original pieces." The penthouse&apos;s distinctive moldings also were restored, or in cases where pieces were missing, were replicated. "Some were so encrusted by paint or had otherwise been compromised over time that we could not salvage them," he says. "It required some architectural forensic work, but we made plaster casts so we could do a perfect match." The penthouse had remained virtually untouched for a half century, and aside from aesthetic considerations, there were floor plan issues to be resolved. "Because the space had been assembled over time – two 750-sq.ft. units were added at different times to double the size – the back had a rather hodgepodge arrangement resulting from growing by accretion rather than design," says Connolly. "Given its proximity to Carnegie Hall, the building was originally designed with rehearsing musicians, actors and singers in mind so the walls were extra thick – some were 12 inches thick – to provide soundproofing between units. And many of the partitions in the back of the penthouse were in fact thicker structural walls and could not be moved or removed." Notwithstanding these restrictions, the architects were able to slightly reconfigure the back to give it a better flow. Each of the original units had only one bathroom, and the firm reconfigured these three. The firm also came up with a solution for an enlarged master suite that includes a large fourth bathroom featuring his and her dressing rooms. They left one of the biggest and most significant rooms, Alvary&apos;s corner office, largely in place although its character was changed. "The irregularly jogged and T-shaped hallway that was produced when the units were added was clearly an afterthought," says Connolly. "The Alvarys simply removed portions of walls to connect the three units, but we streamlined the circulation to make it look deliberate. And we widened it near the kitchen and dining room so it looks like a sequence of spaces instead of an elongated passageway." Windows throughout the penthouse were replaced with energy-efficient double-glazed ones. "Apparently, no windows in any of the apartments had been changed since the building had become landmarked in 1991, and the ones we designed to closely replicate the originals have since become the de facto model for any future replacements," says Connolly. Electrical, heating and plumbing systems were upgraded and discreetly installed without sacrificing the original architecture. The ductwork for the central air conditioning system was routed above the hallways, bathrooms and closets so ceilings in the main rooms did not have to be dropped or punctured with grilles. For the most part, it was decided to allow the rooms to maintain the functions they had had when the Alvarys lived here. "Thus, one of the rooms off the foyer, originally the library when the building was constructed, continued its use as a guest bedroom suite," says Connolly. "We gutted the kitchen but didn&apos;t change the size – we had suggested making it larger – but the client felt comfortable leaving it as it was. And the owners preferred to continue to use the large room off the foyer as a family room, even if that meant their dining room was relegated to a smaller room adjacent to the kitchen. "Although we might have assigned different uses to the principal reception rooms, the important thing is that our clients have the functionality that suits their particular lifestyle." 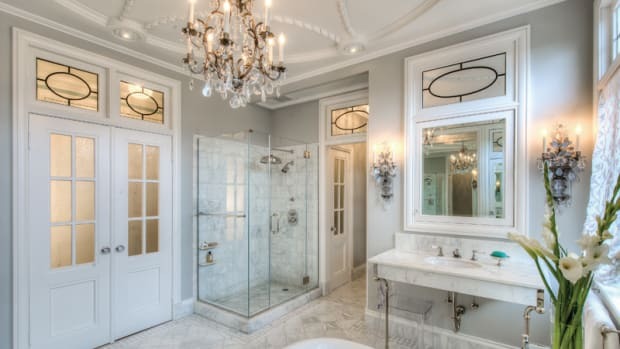 The original bathroom, which is off the hallway, was very utilitarian, but the architects made it more decorative as it serves more as the guest powder room these days. In addition to the kitchen and bathrooms, the family room and the office got significant makeovers. 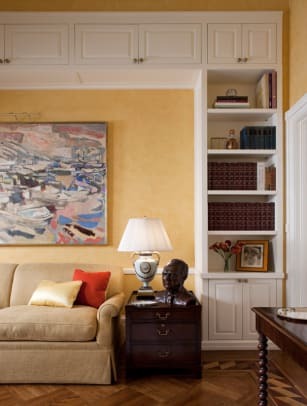 Alvary&apos;s office was repurposed as a gentleman&apos;s library by adding new bookcases and Brazilian mahogany paneling of a handsome design whose proportions accommodated various nuances around the perimeter of the room. "Two of the walls had mahogany-framed windows, and one had a mahogany door," says Connolly. "And there were awkward wall jogs where the building&apos;s plumbing risers were concealed. The sequencing and spacing of the paneling handsomely tied together the four disparate walls and also absorbed the irregularities such that they looked deliberate rather than accidental." A formerly sealed off fireplace was opened and reactivated at one end of the family room. Over the years, the building&apos;s superintendent had made a policy of salvaging historic components from apartments that had been gutted or modernized, often with the attendant removal of original detail. Two original wood mantelpieces had been stored in the basement, and one of these was refinished and reused in the Alvary apartment with only minor adjustments to its dimensions. The firebox surround was newly decorated with bronze mosaic tiles that pay homage to the color and intricate tile patterns in the Osborne&apos;s iconic lobby. The owners wanted to keep most of the Alvary furnishings, including the dining table and chairs. And the granddaughter wanted to highlight her grandparents&apos; art collection, which includes works by Pablo Picasso, Stuart Davis, Henri Matisse and Fernand Leger. 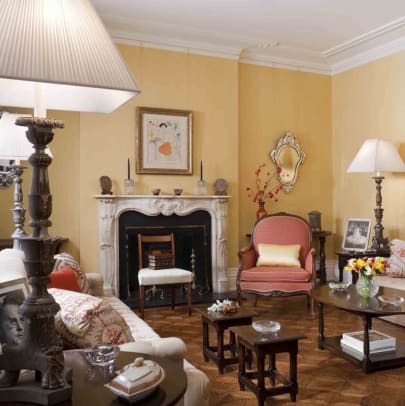 Manhattan interior designer Marcy V. Masterson, who was charged with brightening the rooms, reupholstered the furniture in rich, lively colors and hung the paintings on walls painted vibrant shades of yellow and red to show them off. She added drapery treatments whose styles contemporize the past while complementing it. The most dramatic new decorative architectural detail is found in the living room, where the architects designed millwork and cabinetry to house the client&apos;s collection of heirloom Chinoiserie porcelain and to frame an enormous oil portrait of Alvary in full costume for a Met role. The singer, pictured in his prime, looks out over the room, nodding as if in approval of the changes in his longtime home.